The following filling instructions are clearly indicated on the inside of door. Nitrogen is lethal to human life. 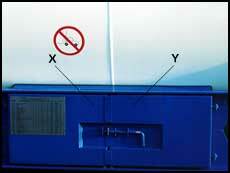 If a tank is nitrogen purged nobody should attempt to enter this tank unless it has been vented and tested before. nitrogen will cause collapse and death within minutes. Make sure that the tank is empty and gas-free. Connect the earth wire to the earth points provided on the tank frame. 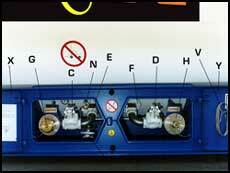 Apply TIR seals to all sealing points. The remote control cable V should be hooked onto ring N. In an emergency a sharp pull on the remote cable will automatically close off the excess flow valves E and F.
Follow the instructions under Filling. - To prevent this the Nitrogen volume flow should be controlled in order not to overstep the Nitrogen storage tank evaporator capacity. Once the oxygen has been displaced, close off the gas phase globe valve D and allow the pressure to build up to between 1 and 2 bar. Once this pressure is reached, close the excess flow valves by pushing back handle A following the instructions for closing under Filling or Emptying.